Background: Cognitive impairment is said to be a core feature of schizophrenia. Executive function is an important cognitive domain. Aim: This study was undertaken to assess cognitive impairment among Indian patients with schizophrenia (Sz) or schizoaffective disorder (SzA), compared with their parents and unaffected individuals (controls). Settings and Design: Executive functions as measured by Trail-making Test (TMT), of patients and their parents were compared with controls. The patients were recruited from the Outpatients' Department (OPD) of a government hospital. Materials and Methods: Patients diagnosed as Sz or SzA (n=172) and their parents (n=196: families n=132, 119 fathers and 77 mothers) participated. We also included 120 persons with no history of psychiatric illness. Cognitive function was assessed with the TMT. The Information Score of the Post Graduate Institute Battery of Brain Dysfunction test, developed in India for Indian subjects was used as a proxy for general fixed knowledge. Statistical Analysis: Logistic and linear regression was used to compare cognitive deficits of cases, parents and controls. Results: Cases and their parents took significantly more time than controls on Part B of the TMT. There were no statistically significant differences between cases and parents on any of the TMT parameters. Using regression analysis, the most significant correlates of all TMT parameters among cases were with occurrence of auditory hallucinations and current age. Conclusion: Cases, as well as their parents showed more cognitive impairment than controls on the TMT. Background: An audit of autopsies of maternal deaths is important for the establishment of accurate cause of maternal deaths and to determine the contribution of various etiologies responsible in a given community. Aim: To study the causes of maternal deaths as determined by a pathological autopsy. Settings and Design: A retrospective study of all the cases of maternal deaths that underwent a pathological autopsy in a tertiary healthcare center from January 1998 to December 2006. Materials and Methods: The autopsy records with clinical notes were retrieved; gross and histopathology specimens and slides were studied to establish the accurate cause of maternal deaths. The variables like age (years), stay in the hospital, gravidity, trimester of pregnancy and method of delivery were used to classify and analyze the data from the autopsies. The causes of maternal deaths were divided in to direct and indirect; each being classified into subgroups based on the most evident pathology on autopsy. Results: The Maternal Mortality Rate (MMR) over a nine-year period (1998-2006) was 827/100000 live births (471 maternal deaths against 56944 live births). An autopsy was performed in 277 cases (58.8%). In the autopsy group, the most common causes of maternal mortality were pre-ecclampsia/ecclampsia (40 of 277, 14.44%) and hemorrhage (32 of 277; 11.55%); However, indirect causes like infectious diseases (27 of 277; 9.75%) and cardiac (27 of 277; 9.75%) disease also contributed to maternal deaths. Conclusion: Indirect causes like rheumatic heart disease and infections like tuberculosis, malaria or leptospirosis and nutritional anemia are still major causes of maternal mortality in developing countries like India. Intensive efforts need to be taken in these areas to reduce the maternal mortality in developing countries like India. Background: The process of audit standardizes protocols in departments and has long-term benefits. Maternal autopsies though routinely performed, deserve a special attention. Aims: This study was carried out to calculate the maternal mortality ratio (MMR) in a tertiary care hospital and to correlate final cause of death with the clinical diagnosis. An audit of maternal autopsies was carried out to evaluate current practices, identify fallacies and suggest corrective measures to rectify them. Materials and Methods: Eighty-nine autopsies of maternal deaths in the period 2003 to 2007 were studied in detail along with the clinical details. Results: There were 158 maternal deaths and 13940 live births in this five-year period. Maternal mortality rate was found to be very high (1133/ 100000 live births) in our institution with a high number of complicated referral cases (68/89 cases, 76%). Of the 89 autopsies, acute fulminant viral hepatitis was the commonest cause of indirect maternal deaths (37 cases, 41.5%). This was followed by direct causes like pregnancy-induced hypertension (12 cases, 13.4%) and puerperal sepsis (10 cases, 11.2%). Certain fallacies were noted during the audit process. Conclusion: During the audit it was realized that in maternal mortality autopsies, special emphasis should be given to clinicopathologic correlation, microbiological studies, identification of thromboembolic phenomenon and adequate sectioning of relevant organs. 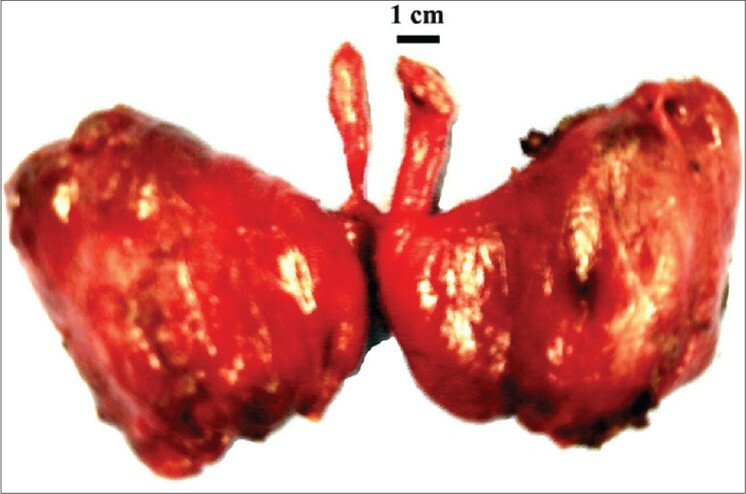 We found difficulty in identification of placental bed in the uterus in postpartum autopsies. A systematic approach can help us for better understanding of the pathophysiology of diseases occurring in pregnancy. Background: Need for undertaking prostate biopsies for detection of prostate cancer is often decided on the basis of serum levels of prostate specific antigen (PSA). Aim: To evaluate the case detection rate of prostate cancer among patients presenting with lower urinary tract symptoms (LUTS) on the basis of PSA levels and to assess the scope of prostate biopsy in these patients. Setting and Design: A retrospective study from a tertiary care center. Materials and Methods: The clinical and histopathological data of 922 patients presenting with LUTS in the last five years was obtained from the medical record section. They had been screened for prostate cancer using PSA and /or digital rectal examination examination followed by confirmation with prostate biopsy. Statistical Analysis Used: Detection rate and receiver operating characteristic curve were performed using SPSS 16 and Medcalc softwares. Results: The detection rate of prostate cancer according to the PSA levels was 0.6%, 2.3%, 2.5%, 34.1% and 54.9% in the PSA range of 0-4, 4-10, 10-20, 20-50 and >50 ng/ml, respectively. Maximum prostate cancer cases were detected beyond a PSA value of 20 ng/ml whereas no significant difference in the detection rate was observed in the PSA range of 0-4, 4-10 and 10-20 ng/ml. 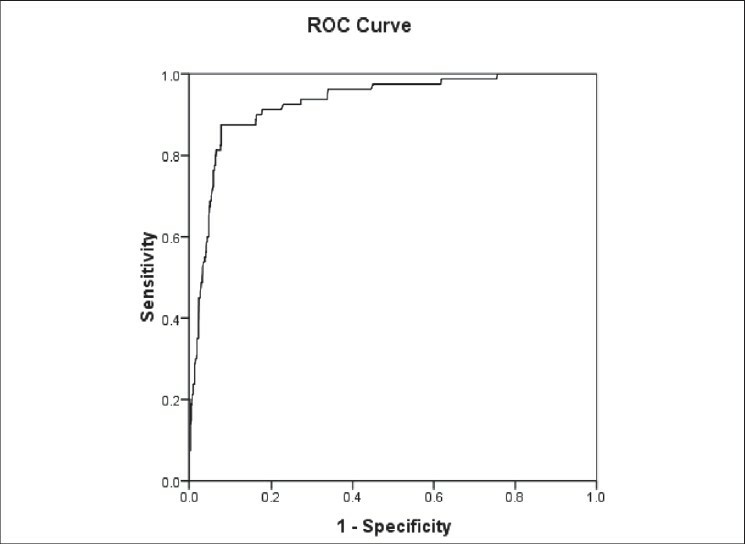 Conclusion: A low detection rate of prostate cancer observed in the PSA range of 4-20 ng/ml in LUTS patients indicates the need for use of higher cutoff values of PSA in such cases. Therefore we recommend a cutoff of 20 ng/ml of PSA for evaluation of detection rate of prostate cancer among patients presenting with LUTS. Aim: To assess the efficacy of internal sphincterotomy compared with application of topical 2% Diltiazem ointment after hemorrhoidectomy for pain relief. Settings and Design: Prospective randomized study. 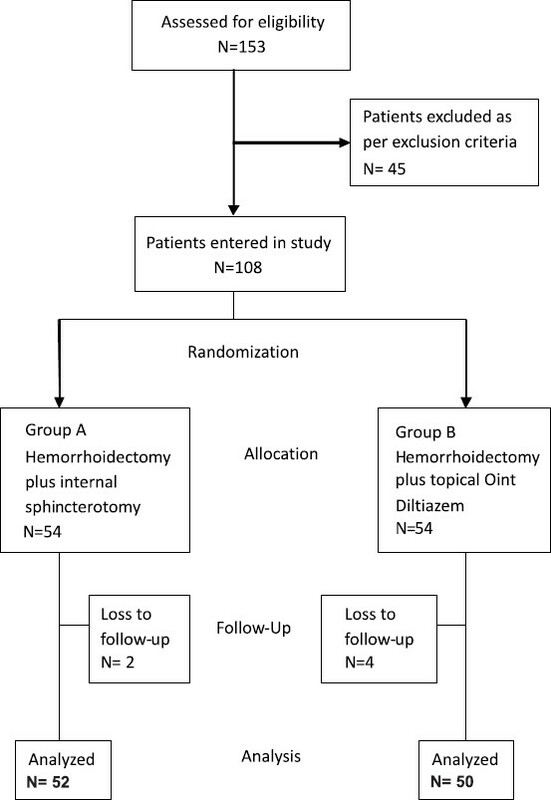 Materials and Methods: In an 18-month period, 108 subjects with uncomplicated Grade 3/ 4 hemorrhoids were enrolled in the study and were randomized into two equal groups: Subjects in Group A underwent internal sphincterotomy at time of primary surgery while those in Group B received 1 g of 2% Diltiazem ointment locally, thrice daily for seven days. Postoperative pain perception was measured using visual analog score (VAS) and on the basis of number of analgesic tablets (Tab tramadol 50 mg) required in each group. Time to discharge, time to return to work and incidence of complications measured and compared. Statistical Analysis Used: Statistical techniques applied were Student T test, Chi-square and Fisher's Exact Test. Results: There were 102 analyzable subjects (Group A: 50 and Group B: 52). The mean VAS score was significantly less in the internal sphincterotomy group from the fourth postoperative day onwards compared to topical Diltiazem (2.23 vs. 3.72; P =0.031). Similarly, the mean requirement of analgesic tablets [10.54 vs. 15.40; P =0.01] was much lower in Group A. There was no significant difference in terms of time to discharge and time to return to work between the two groups. The incidence of complications was more with the internal sphincterotomy group (11.5% vs. 3 %; P =0.488). Conclusions: In patients undergoing hemorrhoidectomy, addition of surgical internal sphincterotomy results in lesser pain in the postoperative period as compared to those receiving topical application of Diltiazem. Background: Telmisartan provides effective treatment of hypertension in a broad spectrum of patients. Aims: To evaluate factors affecting the efficacy of telmisartan in daily clinical practice. Setting and Design: Prospective practice-based 12-week uncontrolled cohort study. Materials and Methods: Consecutive incident/prevalent outpatients with mild to moderate essential hypertension were started on telmisartan 40 mg/day with optional up-titration to 80 mg/day in order to achieve seated systolic (SSBP) and diastolic (SDBP) blood pressure <140/90 mm Hg. Intent-to-treat (ITT, N=282) and per protocol (PP, N=275) efficacy assessment was based on SSBP/SDBP reduction and delivered doses. Results: SSBP/SDBP decreased (165.2±13.1 / 98.3±6.7 mm Hg to 137.9±13.2 / 82.6±7.3 mm Hg), whilst telmisartan was up-titrated in 40.5% of patients during the study. Multivariate (practically identical ITT and PP) analysis indicated poorer response in obese vs. non-obese patients: lesser SDBP reduction (by around 2.2-2.3 mm Hg, P <0.05) with higher odds of dose up-titration (odds ratio, OR around 1.90, P <0.05); and better response in: a) patients started on telmisartan monotherapy than when added to a preexisting treatment: greater SSBP/SDBP reduction (by around 4.0 and 3.0 mm Hg, respectively, P <0.05) with comparable odds of up-titration; b) diabetics vs. non-diabetics: greater SDBP reduction (by around 3.6-3.7 mm Hg, P <0.05) with comparable odds of up-titration; c) men vs. women: slightly greater SDBP reduction (by around 1.2 mm Hg, 0.05< P <0.1) with lower odds of up-titration (OR around 0.51, P <0.05). Conclusion: Previous unsuccessful treatment, obesity, diabetes and gender should be considered in order to optimize the use of telmisartan for mild to moderate essential hypertension in daily clinical practice. 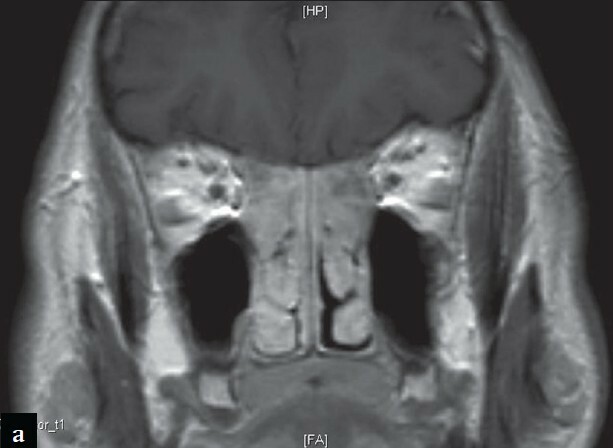 A 74-year-old man underwent multidetector CT virtual cystoscopy due to macroscopic hematuria. A large, irregularly-surfaced, solid bladder mass was detected, infiltrating the perivesical fat, the seminal vesicles and the prostate. CT examination of the chest and abdomen showed no distant metastases. Radical cystectomy was performed and pathology reported pure small cell carcinoma of the urinary bladder. Alkaptonuria is a rare autosomal recessive metabolic disorder that may present with multi-system involvement such as ochronotic arthropathy, renal, urethral and prostatic calculi, cardiac valvular lesions and pigmentation of the skin, sclera, cartilage and other connective tissues. 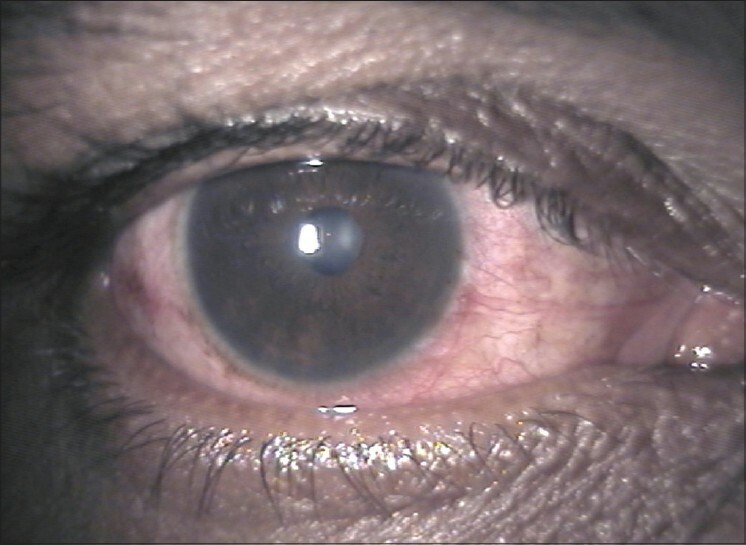 An association of the disease with uveitis has never been reported. 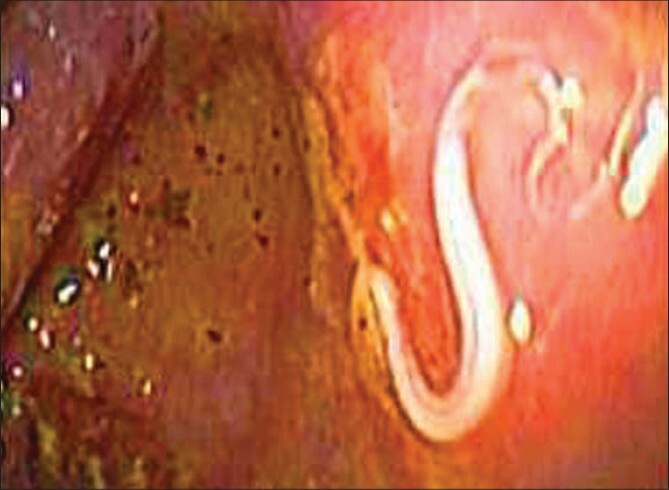 We report the first case of alkaptonuria with ochronotic arthropathy presenting with recurrent acute anterior uveitis as the initial manifestation. The possible common link with the HLA-B27 gene is discussed. 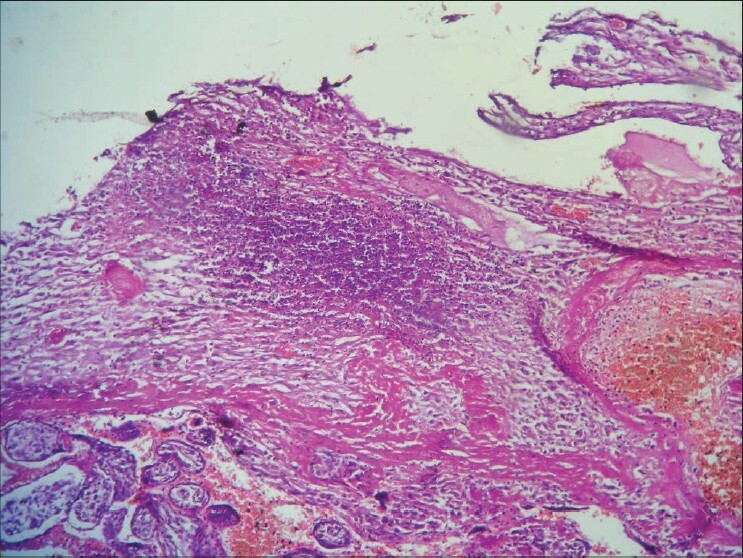 Pulmonary tumor thrombotic microangiopathy (PTTM) is a rare condition characterized by the presence of diffuse thrombotic microthrombi and fibrocellular intimal proliferation in the pulmonary vasculature. Its development is linked to the presence of pulmonary tumor microemboli (PTM) and should be suspected in patients with unexplained dyspnea, especially in the presence of adenocarcinoma. 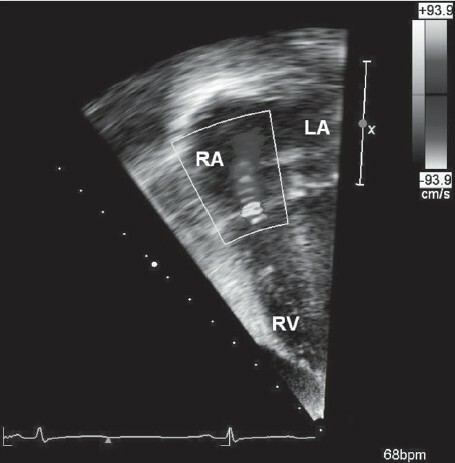 PTTM presents in a similar fashion to respiratory disease such as pulmonary embolism, pulmonary hypertension or pneumonia and is usually only diagnosed post-mortem. 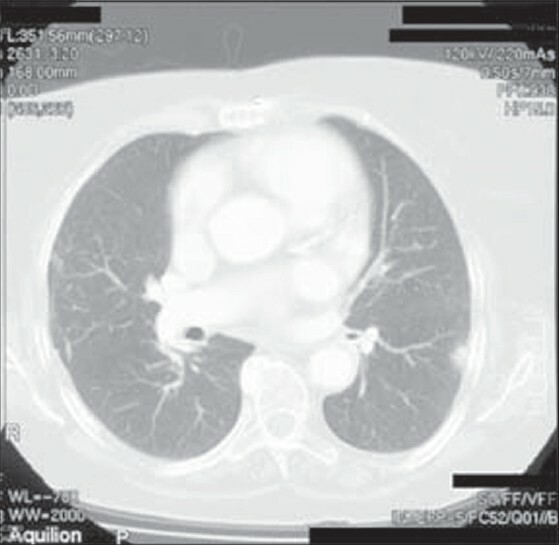 We report a case of PTTM identified ante-mortem by bronchial biopsy in an 82-year-old woman presenting with a clinical picture of atypical pneumonia. Autopsy confirmed PTTM, from an unknown primary neoplasm. Obesity is a growing health problem in developed nations and in countries that are in the process of westernization like India. Obesity is linked with several health disorders such as hypertension and cardiovascular diseases, Type 2 diabetes, dyslipidemia and certain cancers. Currently, obesity-related malignancies, e.g., cancers of the breast, prostate and colon are the leading cancers in the industrialized societies. An increased amount of fat or adipose tissue in an overweight or obese person probably influences the development of cancer by releasing several hormone-like factors or adipokines. 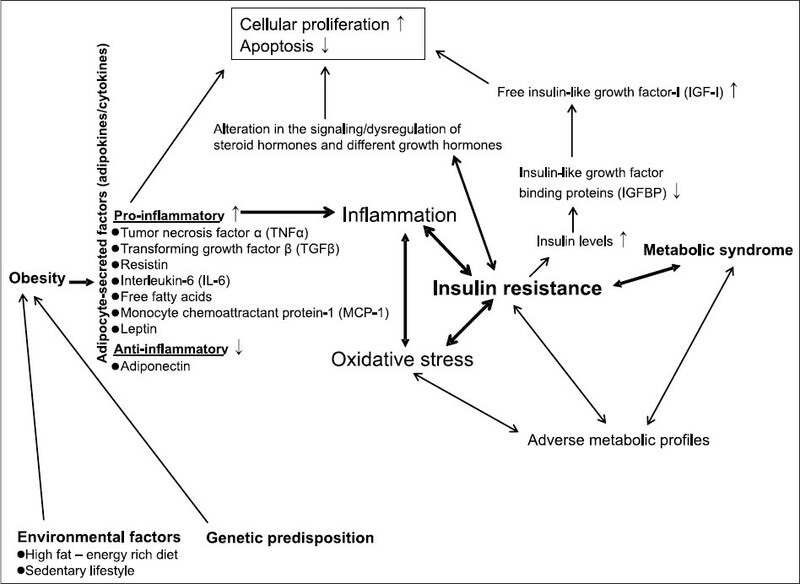 The majority of adipokines are pro-inflammatory, which promote pathological conditions like insulin resistance and cancer. On the other hand, many recent studies have shown that adiponectin, an anti-inflammatory adipokine, has anti-cancer and insulin-sensitizing effects. Adiponectin exerts its physiological functions chiefly by activation of AMP kinase via adiponectin receptors. Interestingly, several fruits and vegetables may contain adiponectin-like molecules or may increase the biosynthesis of adiponectin in our body. Studies on adiponectin analogues or adiponectin receptor agonists are a promising area of cancer chemoprevention research. In general, fruits and vegetables contain various dietary substances such as vitamins, minerals (like calcium and selenium), fiber and phytochemicals or phenolic compounds (like flavonoids and vanilloids), which may act as anti-cancer agents. Similarly, several dietary constituents including phytochemicals may have anti-obesity effects. Consumption of such dietary compounds along with caloric restriction and physical activity may be helpful in preventing obesity-related cancers. For this review article, we searched PubMed primarily to get the relevant literature. Venous thromboembolism (VTE) has been a subject of great interest of late. Since Rudolph Virchow described the famous Virchow's triad in 1856, there have been rapid strides in the understanding of the pathogenesis and factors responsible for it. Discovery of various thrombophilic factors, both primary and acquired, in the last 40 years has revolutionized prognostication and management of this potentially life-threatening condition due to its associated complication of pulmonary thromboembolism. Detailed genetic mapping and linkage analyses have been underlining the fact that VTE is a multifactorial disorder and a complex one. There are many gene-gene and gene-environment interactions that alter and magnify the clinical picture in this disorder. 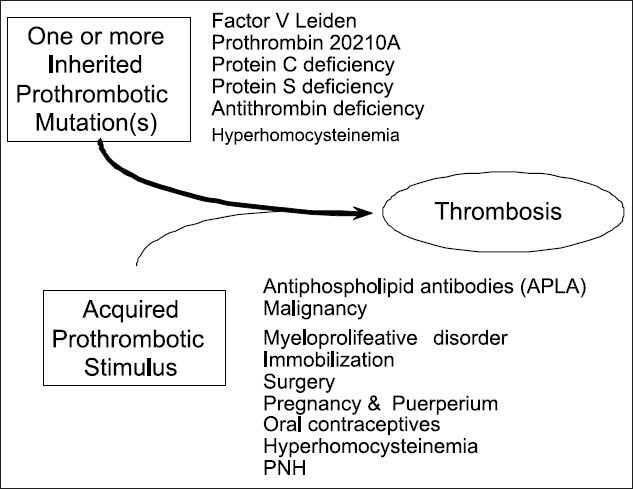 Point in case is pregnancy, where the risk of VTE is 100-150 times increased in the presence of Factor V Leiden, prothrombin mutation (Prothrombin 20210A) and antithrombin deficiency. Risk of VTE associated with long-haul air flight has now been well recognized. Thrombotic events associated with antiphospholipid syndrome (APS) are 70% venous and 30% arterial. Deep venous thrombosis and pulmonary embolism are the most common venous events, though unusual cases of catastrophes due to central vein thrombosis like renal vein thrombosis and Budd-Chiari syndrome (catastrophic APS) may occur. We present a rare but potentially harmful adverse reaction of propofol. A 50-year-old patient was posted for laparoscopic cholecystectomy, developed generalized convulsions after few seconds of propofol administration at anesthesia induction. Convulsions subsided with intravenous administrations of thiopentone and midazolam. Patient remained hemodynamically stable and surgery was uneventful. Blood sugar, serum electrolytes and arterial blood gas analysis were normal. 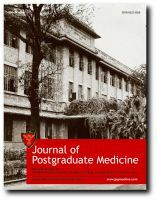 Postoperatively, there was no evidence of postictal phase, serum electrolytes and postoperative computerized tomographic scanning of the head were normal. Patient had uneventful recovery. The administration of propofol has been associated with abnormal movements collectively termed as seizure-like phenomenon. Despite the claims that propofol may have proconvalsant activity, there is significant amount of evidence to the contrary also. The pathophysiological mechanisms behind the neuroexcitatory symptoms with propofol are unknown. Propofol alters the conscious state, the transition from the conscious state to anesthesia or vice versa may be a particularly vulnerable period and may be prolonged after the end of propofol administration.